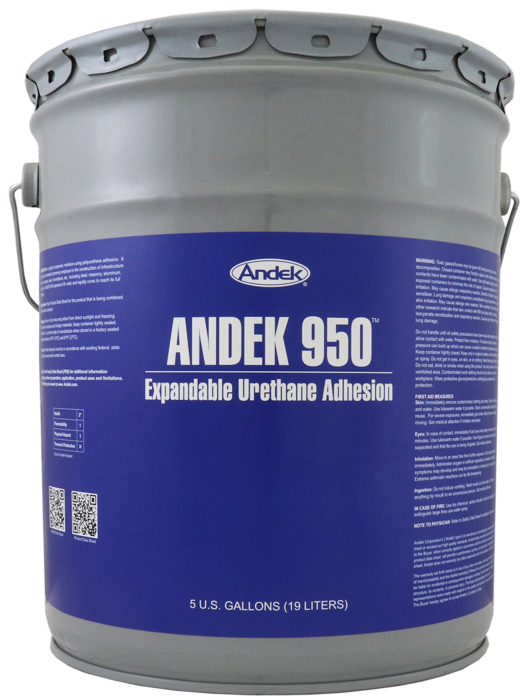 ANDEK 950 is a single component, moisture curing polyurethane adhesive. It will bond all materials commonly employed in the construction of infrastructure such as bridges, piers, foundations, etc., including steel, masonry, aluminum, wood, etc. ANDEK 950 expands to fill voids and rapidly cures to reach its full strength. Can be used over concrete, mineral composites, wood, wood composites, most metals, fibreglass composites, porous stone, non-porous stone, rubber, some plastics and other surfaces. For pressure injection: All cracks to be treated should be clean and dry. Drill ½” diameter holes 3″ deep into all visible cracks at intervals of one per 18″ of running crack. Coat ⅜” diameter plastic ports with ANDEK 950 and insert into the holes, the ANDEK 950 will glue the ports into place. After all entry ports have set, apply ANDEK 950 over the cracks and while still wet, encapsulate a layer of 4″ wide POLAFAB over the crack with a 2nd coat of ANDEK 950. Only one side of the structure should be prepared, with the opposite face or side left untouched. As soon as the ANDEK 950 has thoroughly cured (8-12 hours after the last application), injection may commence. A Graco 45:1 King or similar equipment with ½” diameter hose and insertion nozzle should be used. Insert bungs into all entry ports except the one that is to be connected to the flow. Begin at the lowest entry port and progress systematically upwards, replacing the bungs after each application is complete. Inject ANDEK 950 into each entry port at 100 psi; flow rate will be determined by the extent of the interior cracks. Observation of the opposite face will determine when all interior cracks are filled as ANDEK 950 should begin to surface. Andek 950 will swell upon curing. All equipment should be cleaned with xylene before cure takes place. When sealing horizontal cracks: ANDEK 950 (low viscosity, Type ‘B) is applied into the crack using a bulk gun with the necessary width of nozzle following the same procedure with injection ports and POLAFAB. Voids in poured screeds may also be treated in a similar manner. All equipment should be cleaned with xylene before cure takes place. Avoid humid atmospheres and keep lids tightly closed.